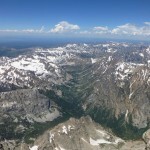 I nearly spent the whole month in the Tetons without either climbing with Keith or summiting the Grand, but we finally teamed up on my last day to climb the east ridge, the longest route on the mountain. I woke up once for a downpour, once more for some guy who kept shining his headlamp at my face, and finally for my alarm at 3:00 AM. Because Burnt Wagon Gulch is just that awful, we drove over to Lupine Meadows, hitting the trail around 3:50 AM. By the time we reached the switchbacks, it was already t-shirt (or no-shirt) weather, suggesting that we were in for a brutally hot morning on our east-facing route. 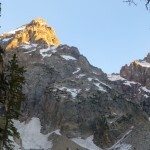 We reached Amphitheater Lake by 5:45, and the base of the route about an hour later. 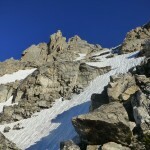 Despite its name, most of the east ridge route stays left of the ridge itself. The first 2,000 feet, from the moraine to the Molar Tooth, are easy class 2-3 scrambling on grassy benches between short granite cliffs. 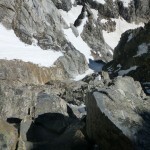 We had to cross a couple short patches of snow, but stayed mostly on dry ground and rock. 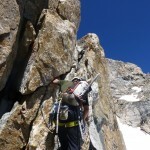 Reaching the Molar Tooth, we headed left, then up broken 4th or low 5th class ground, finding a nest of slings and passing through a tunnel under a slung chockstone to the southwest side. The climbing finally became rope-worthy here, at least while wearing running shoes. Keith led one pitch, up a meandering hand crack and across some lower-angle ground for somewhat less than a full rope length. 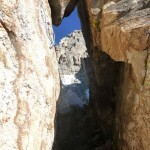 I led through a short, relatively tricky traverse, then up some blocks and across some mud to the end of the rope. 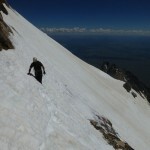 From there, Keith kicked his way up snow to the col west of the Molar Tooth, clipped two fixed pins, and pulled through the crux, mantling onto a wet, outward-sloping slab. Being a considerate person, he put in a piece for me above it before traversing right onto easier, slabby ground. 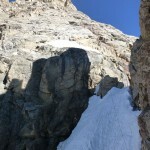 We unroped here quickly soloing up the easy, slabby terrain to the southeast side of the Second Tower. The book describes crossing behind a gendarme to the north side of the ridge, but we apparently missed it. Instead, we climbed around to the south side of the Tower, then up some steep, blocky, and very rotten low 5th class rock back to the ridge. I was in my crappy-rock element; Keith was not amused. Continuing on easier ground, we found ourselves cliffed out south of where the ridge meets the Grand’s east snowfield, and realized our error. Retreating to a notch in the ridge, we found about 2-1/2 rap anchors, proof that we were not the only ones to make this mistake. I pillaged a nut from one, which Keith used to shore up one of the others, from which we made a 30 meter rap back to the route on the north side. Keith led a short pitch up the “flake-filled chimney” (really just some flakes with big air on one side), then we put the gear away. 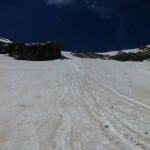 The summit slush-field was more tedious than treacherous to us, though we managed to set loose some wet slides that would have been bad news for anyone in the couloirs below. 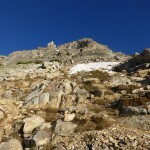 After an endless, sweaty, calf- to knee-deep traverse, we reached the upper end of the Exum Ridge, from which easy rock and yet more slush-climbing led to the summit. 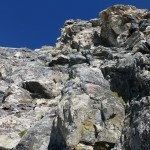 After enjoying the near-perfect weather and views, we returned via the standard Owen-Spalding route (with rappel). 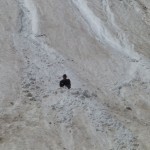 We mostly avoided snow by staying left above the Lower Saddle, then shot down one of the parallel luge tracks to the moraine and stitched together patches of snow for a partial boot-ski to the meadows. After a long-ish hike (not taking the shortcuts for a change), we returned to the car in just over 12 hours.